This is one of our "forgotten" dishes. We used to have this frequently growing up, but not having access to calamansi in almost 20 years, we forgot we loved this dish so much. We tried making this during our "experimental" meal planning period and suddenly, all the memories come rushing back. We still don't have access to calamansi, but lime (or even lemon) -- even though they really are not the same at all -- would do in a pinch. It's a two-step process. 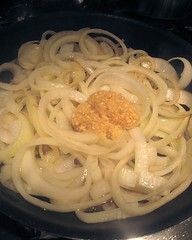 First, caramelizing the onions. Check out the big wad of minced garlic there. Teehee. I can't help myself sometimes. 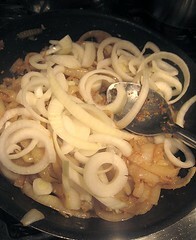 Because JS wanted some onions with a little bit of bite left, I started about half the onions first, and added the second half midway through the caramelization process. I set the onions aside. 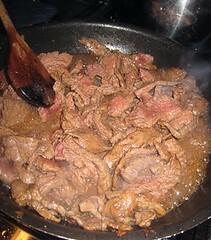 Next, I added thinly-sliced beef into the pan and seasoned it with soy sauce, sugar, and because we didn't have any kalamansi on hand, some lime juice. I tend to like it on the tangy and sweet side. 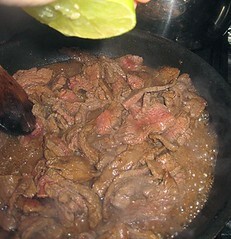 When the beef was almost cooked though, I added the onions back. Needless to say, this is fantabulous over white rice. JS said she wanted even more onion bite in her bistek (this is a recent phenomenon), so we added some sliced raw red onions after cooking. The magenta against the brown is looking a little surreal or otherwordly to me. Hm. I love this...no really, I do. This looks amazing. This is definitely a dish of my childhood - yum! Oh yeah, this is one I have to make! 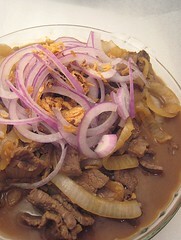 I am surprised on how many Mexican and Filipino dishes are the same. We also have bisteces in Mexico, and when they are prepared like this they are called bisteces encebollados. Hmmm how many delicious memories! 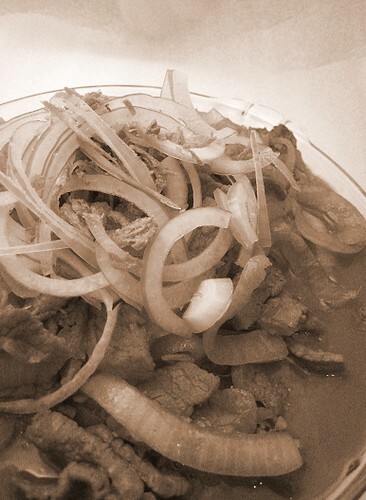 Steak and onions with a lime kick. Sounds tasty. How much soy sauce did you use? We'd love to see it on A Good Appetite! Oops, we didn't measure it out in this case. I guess I can only say that for this dish, the soy sauce is the only source of salt. Hope that helps! That Starry, Starry night opened the floodgates. We didn't realize how many Filipino dishes we had here until we started listing them down.